Connecticut Orthopaedic Specialists have announced the enrollment of the initial patients within Simplify Medical’s clinical trial to evaluate the Simplify Disc, its novel investigational cervical disc, at two adjacent cervical levels. James J Yue, a spine and neck specialist at Connecticut Orthopaedic Specialists, is leading the trial site as a study investigator. 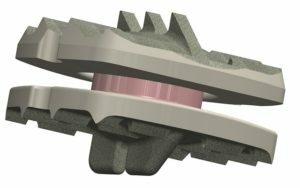 The Simplify Disc is a titanium-coated, PEEK on ceramic, anatomically-designed, biocompatible artificial cervical disc designed specifically for motion preservation and diagnostic imaging optimisation. The two-level IDE trial, designed to investigate the clinical efficacy of the disc, is a prospective, multi-centre, clinical trial evaluating the disc at 18 clinical sites in the USA. The trial compares the disc with anterior cervical discectomy and fusion (ACDF) as a historical control. In a previous Simplify Medical clinical trial, despite the predecessor device under investigation demonstrating superiority over fusion at one level for all patients, men did statistically better than women. Speaking exclusively to Spinal News International recently, Simplify Medical CEO David Hovda explains, “We did a lot of research into what could possibly cause a difference in outcome based on gender. We concluded that our lowest height, in retrospect, was too tall. Women were getting their disc space relatively more distracted than men, which we believed was leading to the inferior outcome.” According to the literature, average cervical disc height is approximately 4mm; the smallest cervical disc offered by Simplify Medical was 5.7mm at that time. Enrollment for this clinical trial is expected to be complete by the end of 2018.